For this month’s “How I Wear My” post, it’s all about the shine. 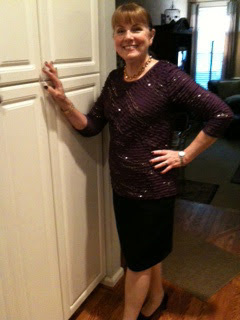 Adrienne of The Rich Life (on a budget) and I agreed this is a great time of year to focus on sequins. I love sequins so much I’m convinced I’m part magpie, the bird attracted to shiny objects. I love how you can go full throttle and wear sequins to be the most sparkling person in the room, or use them to infuse your look with a touch of texture and shine, or just add a dash of glamour to denim. I think they are wonderful any time of year and I especially adore the surprise of them in the daytime. Adrienne of The Rich Life (on a budget) in a glorious black sequined jacket. I am also loving the bag! Pam from over50feeling40. Think there aren’t sequins here? Think again! I love how Pam incorporates sequins throughout her look, from a touch peeking out from behind her jacket, to the sequined purse and sequin-like bracelet. Subtle and gorgeous! 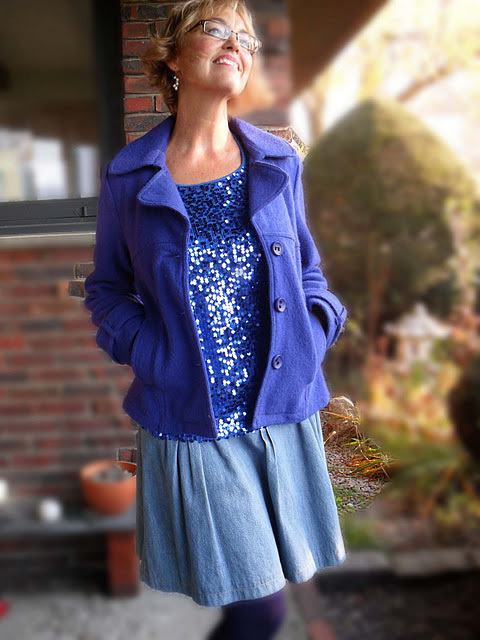 Paula of Fashion Over Fifty, looking ethereal and dreamy in periwinkle sequins. 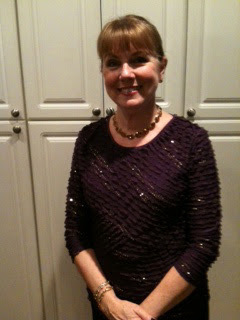 Introducing my mother, looking stylish in an eggplant-colored blouse sprinkled with golden sequins. Topaz Swarovski crystal necklace by Nerida Aylott of Art for Interiors. I wrote a post about it in January which you can read here. Why not get 2012 off to a glamorous start and join Adrienne and me for “How I Wear My: Statement Necklace” on January 3? Send either of us a photo of yourself in your necklace and we will include you, and your blog if you have one, in our post! You are all gorgeous, ahhhhhhhhhhhh and me with no sequins, ahhhhhhhhhhhhhh. Oh my gosh....I am loving this! Pam and Paula and your mother (who is gorgeous, by the way) and you! You all look so chic and beautiful! 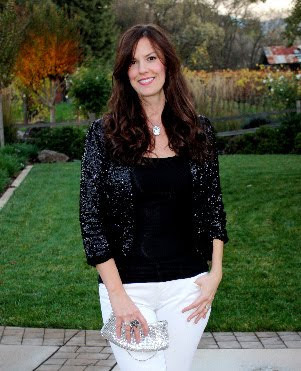 I love sequins and have a great black vintage sequin jacket. I think your mother looks fantastic. This was fun and Jill you look great in your tank...I have a navy blue sequined shirt I bought at KOHLS! Now, when is the statement necklace event!!?? My knee is perfect, I cannot believe it. This second op. with a better surgeon has been so much easier. If I would have been in America I would have sued the first one for such a terrible job. Anyway I am walking more everyday without the help of pain killers, ahhhhhhhhhhhh. Jill--I was so happy to see YOU doing an ootd! You are gorgeous--as is your mom--and of course all the other friends in this post. Sparkling personalities, sparkling outfits. You all look so good! I just bought 2 dresses today to sell that are embellished with sequins, you know what they say? Great minds..like sequins. Very chic look, I love the blue colour of your sequin top! Everyone looks great! Well hello Mum! 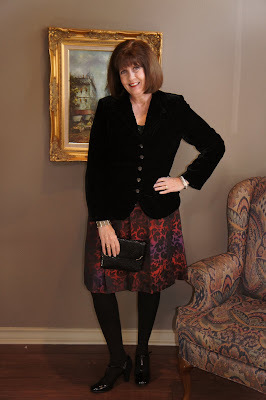 I love sequins - whether it be just a bit (to jazz up jeans as you've shown here) or loads of them - and it's great to see so many different ways of wearing them here by so many different age groups.